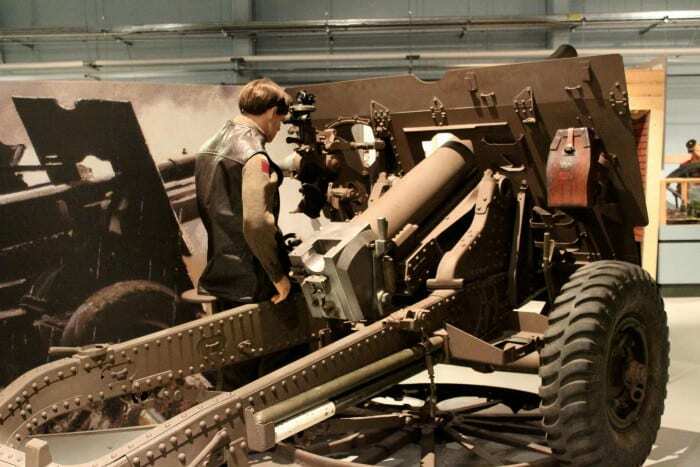 The Quick Firing 25 Pounder (25 Pdr) was the standard Field Gun for the Canadian Artillery during the Second World War. It was designed to replace both the 18 pounder and the 4.5″ Howitzer with the initial issue occurring in England in 1940. The guns were fitted with a muzzle brake in 1943. The unique platform allowed the gun an unprecedented 360 degrees of traverse. A self-propelled version mounted on a Ram tank was made in Canada which equipped all Commonwealth and Polish armoured divisions. Canadians used the 25 Pdr in action in Sicily, Italy and North West Europe 1943-45 and in Korea 1951-53. It remained in service in Canada until 1956.